Stonehenge has been a legally protected Scheduled Ancient Monument since 1882 when legislation to protect historic monuments was first successfully introduced in Britain. The site and its surroundings were added to UNESCO‘s list of World Heritage Sites in 1986. Stonehenge is owned by the Crown and managed by English Heritage; the surrounding land is owned by the National Trust. Stonehenge could have been a burial ground from its earliest beginnings. Deposits containing human bone date from as early as 3000 BC, when the ditch and bank were first dug, and continued for at least another five hundred years. The Oxford English Dictionary cites Ælfric‘s tenth-century glossary, in which henge-cliff is given the meaning “precipice”, or stone, thus the stanenges or Stanheng “not far from Salisbury” recorded by eleventh-century writers are “supported stones”. Christopher Chippindale‘s Stonehenge Complete gives the derivation of the name Stonehenge as coming from the Old English words stān meaning “stone”, and either hencg meaning “hinge” (because the stone lintels hinge on the upright stones) or hen(c)en meaning “hang” or “gallows” or “instrument of torture” (though elsewhere in his book, Chippindale cites the “suspended stones” etymology). Like Stonehenge’s trilithons, medieval gallows consisted of two uprights with a lintel joining them, rather than the inverted L-shape more familiar today. The “henge” portion has given its name to a class of monuments known as henges. Archaeologists define henges as earthworks consisting of a circular banked enclosure with an internal ditch. As often happens in archaeological terminology, this is a holdover from antiquarian use, and Stonehenge is not truly a henge site as its bank is inside its ditch. Despite being contemporary with true Neolithic henges and stone circles, Stonehenge is in many ways atypical—for example, at more than 7.3 metres (24 ft) tall, its extant trilithons supporting lintels held in place with mortise and tenon joints, make it unique. Stonehenge was a place of burial from its beginning to its zenith in the mid third millennium B.C. The cremation burial dating to Stonehenge’s sarsen stones phase is likely just one of many from this later period of the monument’s use and demonstrates that it was still very much a domain of the dead. Stonehenge evolved in several construction phases spanning at least 1500 years. There is evidence of large-scale construction on and around the monument that perhaps extends the landscape’s time frame to 6500 years. Dating and understanding the various phases of activity is complicated by disturbance of the natural chalk by periglacial effects and animal burrowing, poor quality early excavation records, and a lack of accurate, scientifically verified dates. The modern phasing most generally agreed to by archaeologists is detailed below. Features mentioned in the text are numbered and shown on the plan, right. Archaeologists have found four, or possibly five, large Mesolithic postholes (one may have been a natural tree throw), which date to around 8000 BC, beneath the nearby modern tourist car-park. These held pine posts around 0.75 metres (2 ft 6 in) in diameter which were erected and eventually rotted in situ. Three of the posts (and possibly four) were in an east-west alignment which may have had ritual significance; no parallels are known from Britain at the time but similar sites have been found in Scandinavia. Salisbury Plain was then still wooded but 4,000 years later, during the earlier Neolithic, people built a causewayed enclosure at Robin Hood’s Ball and long barrow tombs in the surrounding landscape. In approximately 3500 BC, a Stonehenge Cursus was built 700 metres (2,300 ft) north of the site as the first farmers began to clear the trees and develop the area. A number of other adjacent stone and wooden structures and burial mounds, previously overlooked, may date as far back as 4000 BC. Charcoal from the ‘Blick Mead’ camp 2.4 kilometres (1.5 mi) from Stonehenge (near the Vespasian’s Camp site) has been dated to 4000 BC. The first monument consisted of a circular bank and ditch enclosure made of Late Cretaceous (Santonian Age) Seaford Chalk, measuring about 110 metres (360 ft) in diameter, with a large entrance to the north east and a smaller one to the south. It stood in open grassland on a slightly sloping spot. The builders placed the bones of deer and oxen in the bottom of the ditch, as well as some worked flint tools. The bones were considerably older than the antler picks used to dig the ditch, and the people who buried them had looked after them for some time prior to burial. The ditch was continuous but had been dug in sections, like the ditches of the earlier causewayed enclosures in the area. The chalk dug from the ditch was piled up to form the bank. This first stage is dated to around 3100 BC, after which the ditch began to silt up naturally. Within the outer edge of the enclosed area is a circle of 56 pits, each about a metre (3 ft 3 in) in diameter, known as the Aubrey holes after John Aubrey, the seventeenth-century antiquarian who was thought to have first identified them. The pits may have contained standing timbers creating a timber circle, although there is no excavated evidence of them. A recent excavation has suggested that the Aubrey Holes may have originally been used to erect a bluestone circle. If this were the case, it would advance the earliest known stone structure at the monument by some 500 years. A small outer bank beyond the ditch could also date to this period. In 2013 a team of archaeologists, led by Mike Parker Pearson, excavated more than 50,000 cremated bones of 63 individuals buried at Stonehenge. These remains had originally been buried individually in the Aubrey holes, exhumed during a previous excavation conducted by William Hawley in 1920, been considered unimportant by him, and subsequently re-interred together in one hole, Aubrey Hole 7, in 1935. Physical and chemical analysis of the remains has shown that the cremated were almost equally men and women, and included some children. As there was evidence of the underlying chalk beneath the graves being crushed by substantial weight, the team concluded that the first bluestones brought from Wales were probably used as grave markers. Radiocarbon dating of the remains has put the date of the site 500 years earlier than previously estimated, to around 3000 BC. Analysis of animal teeth found at nearby Durrington Walls, thought to be the ‘builders camp’, suggests that as many as 4,000 people gathered at the site for the mid-winter and mid-summer festivals; the evidence showed that the animals had been slaughtered around 9 months or 15 months after their spring birth. Strontium isotope analysis of the animal teeth showed that some had travelled from as far afield as the Scottish Highlands for the celebrations. Evidence of the second phase is no longer visible. The number of postholes dating to the early 3rd millennium BC suggest that some form of timber structure was built within the enclosure during this period. Further standing timbers were placed at the northeast entrance, and a parallel alignment of posts ran inwards from the southern entrance. The postholes are smaller than the Aubrey Holes, being only around 0.4 metres (16 in) in diameter, and are much less regularly spaced. The bank was purposely reduced in height and the ditch continued to silt up. At least twenty-five of the Aubrey Holes are known to have contained later, intrusive, cremation burials dating to the two centuries after the monument’s inception. It seems that whatever the holes’ initial function, it changed to become a funerary one during Phase 2. Thirty further cremations were placed in the enclosure’s ditch and at other points within the monument, mostly in the eastern half. Stonehenge is therefore interpreted as functioning as an enclosed cremation cemetery at this time, the earliest known cremation cemetery in the British Isles. Fragments of unburnt human bone have also been found in the ditch-fill. Dating evidence is provided by the late Neolithic grooved ware pottery that has been found in connection with the features from this phase. Archaeological excavation has indicated that around 2600 BC, the builders abandoned timber in favour of stone and dug two concentric arrays of holes (the Q and R Holes) in the centre of the site. These stone sockets are only partly known (hence on present evidence are sometimes described as forming ‘crescents’); however, they could be the remains of a double ring. Again, there is little firm dating evidence for this phase. The holes held up to 80 standing stones (shown blue on the plan), only 43 of which can be traced today. 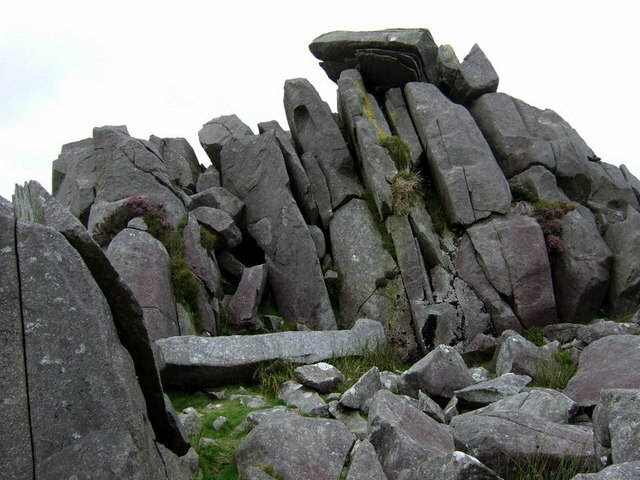 It is generally accepted that the bluestones (some of which are made of dolerite, an igneous rock), were transported by the builders from the Preseli Hills, 150 miles (240 km) away in modern-day Pembrokeshire in Wales. Another theory is that they were brought much nearer to the site as glacial erratics by the Irish Sea Glacier although there is no evidence of glacial deposition within southern central England. The long distance human transport theory was bolstered in 2011 by the discovery of a megalithic bluestone quarry at Craig Rhos-y-felin, near Crymych in Pembrokeshire, which is the most likely place for some of the stones to have been obtained. Other standing stones may well have been small sarsens (sandstone), used later as lintels. The stones, which weighed about two tons, could have been moved by lifting and carrying them on rows of poles and rectangular frameworks of poles, as recorded in China, Japan and India. It is not known whether the stones were taken directly from their quarries to Salisbury Plain or were the result of the removal of a venerated stone circle from Preseli to Salisbury Plain to “merge two sacred centres into one, to unify two politically separate regions, or to legitimise the ancestral identity of migrants moving from one region to another”. Each monolith measures around 2 metres (6.6 ft) in height, between 1 and 1.5 m (3.3 and 4.9 ft) wide and around 0.8 metres (2.6 ft) thick. What was to become known as the Altar Stone is almost certainly derived from the Senni Beds, perhaps from 50 miles east of Mynydd Preseli in the Brecon Beacons. The Heelstone, a Tertiary sandstone, may also have been erected outside the north-eastern entrance during this period. It cannot be accurately dated and may have been installed at any time during phase 3. At first it was accompanied by a second stone, which is no longer visible. Two, or possibly three, large portal stones were set up just inside the north-eastern entrance, of which only one, the fallen Slaughter Stone, 4.9 metres (16 ft) long, now remains. Other features, loosely dated to phase 3, include the four Station Stones, two of which stood atop mounds. The mounds are known as “barrows” although they do not contain burials. Stonehenge Avenue, a parallel pair of ditches and banks leading 2 miles (3 km) to the River Avon, was also added. Two ditches similar to Heelstone Ditch circling the Heelstone (which was by then reduced to a single monolith) were later dug around the Station Stones. During the next major phase of activity, 30 enormous Oligocene–Miocene sarsen stones (shown grey on the plan) were brought to the site. They may have come from a quarry, around 25 miles (40 km) north of Stonehenge on the Marlborough Downs, or they may have been collected from a “litter” of sarsens on the chalk downs, closer to hand. The stones were dressed and fashioned with mortise and tenon joints before 30 were erected as a 33 metres (108 ft) diameter circle of standing stones, with a ring of 30 lintel stones resting on top. The lintels were fitted to one another using another woodworking method, the tongue and groove joint. Each standing stone was around 4.1 metres (13 ft) high, 2.1 metres (6 ft 11 in) wide and weighed around 25 tons. Each had clearly been worked with the final visual effect in mind; the orthostats widen slightly towards the top in order that their perspective remains constant when viewed from the ground, while the lintel stones curve slightly to continue the circular appearance of the earlier monument. The inward-facing surfaces of the stones are smoother and more finely worked than the outer surfaces. The average thickness of the stones is 1.1 metres (3 ft 7 in) and the average distance between them is 1 metre (3 ft 3 in). A total of 75 stones would have been needed to complete the circle (60 stones) and the trilithon horseshoe (15 stones). It was thought the ring might have been left incomplete, but an exceptionally dry summer in 2013 revealed patches of parched grass which may correspond to the location of removed sarsens. The lintel stones are each around 3.2 metres (10 ft) long, 1 metre (3 ft 3 in) wide and 0.8 metres (2 ft 7 in) thick. The tops of the lintels are 4.9 metres (16 ft) above the ground. Within this circle stood five trilithons of dressed sarsen stone arranged in a horseshoe shape 13.7 metres (45 ft) across with its open end facing north east. These huge stones, ten uprights and five lintels, weigh up to 50 tons each. They were linked using complex jointing. They are arranged symmetrically. The smallest pair of trilithons were around 6 metres (20 ft) tall, the next pair a little higher and the largest, single trilithon in the south west corner would have been 7.3 metres (24 ft) tall. Only one upright from the Great Trilithon still stands, of which 6.7 metres (22 ft) is visible and a further 2.4 metres (7 ft 10 in) is below ground. The images of a ‘dagger’ and 14 ‘axeheads’ have been carved on one of the sarsens, known as stone 53; further carvings of axeheads have been seen on the outer faces of stones 3, 4, and 5. The carvings are difficult to date, but are morphologically similar to late Bronze Age weapons; recent laser scanning work on the carvings supports this interpretation. The pair of trilithons in the north east are smallest, measuring around 6 metres (20 ft) in height; the largest, which is in the south west of the horseshoe, is almost 7.5 metres (25 ft) tall. This ambitious phase has been radiocarbon dated to between 2600 and 2400 BC, slightly earlier than the Stonehenge Archer, discovered in the outer ditch of the monument in 1978, and the two sets of burials, known as the Amesbury Archer and the Boscombe Bowmen, discovered 3 miles (5 km) to the west. At about the same time, a large timber circle and a second avenue were constructed 2 miles (3 km) away at Durrington Walls overlooking the River Avon. The timber circle was oriented towards the rising sun on the midwinter solstice, opposing the solar alignments at Stonehenge, whilst the avenue was aligned with the setting sun on the summer solstice and led from the river to the timber circle. Evidence of huge fires on the banks of the Avon between the two avenues also suggests that both circles were linked, and they were perhaps used as a procession route on the longest and shortest days of the year. Parker Pearson speculates that the wooden circle at Durrington Walls was the centre of a ‘land of the living’, whilst the stone circle represented a ‘land of the dead’, with the Avon serving as a journey between the two. The Y and Z Holes are the last known construction at Stonehenge, built about 1600 BC, and the last usage of it was probably during the Iron Age. Roman coins and medieval artefacts have all been found in or around the monument but it is unknown if the monument was in continuous use throughout British prehistory and beyond, or exactly how it would have been used. Notable is the massive Iron Age hillfort Vespasian’s Camp built alongside the Avenue near the Avon. A decapitated seventh century Saxon man was excavated from Stonehenge in 1923. The site was known to scholars during the Middle Ages and since then it has been studied and adopted by numerous groups. Stonehenge was produced by a culture that left no written records. Many aspects of Stonehenge remain subject to debate. A number of myths surround the stones. The site, specifically the great trilithon, the encompassing horseshoe arrangement of the five central trilithons, the heel stone, and the embanked avenue, are aligned to the sunset of the winter solstice and the opposing sunrise of the summer solstice. A natural landform at the monument’s location followed this line, and may have inspired its construction. The excavated remains of culled animal bones suggest that people may have gathered at the site for the winter rather than the summer. Further astronomical associations, and the precise astronomical significance of the site for its people, are a matter of speculation and debate. There is little or no direct evidence revealing the construction techniques used by the Stonehenge builders. Over the years, various authors have suggested that supernatural or anachronistic methods were used, usually asserting that the stones were impossible to move otherwise due to their massive size. However, conventional techniques, using Neolithic technology as basic as shear legs, have been demonstrably effective at moving and placing stones of a similar size. How the stones could be transported by a prehistoric people without the aid of the wheel or a pulley system is not known. The most common theory of how prehistoric people moved megaliths has them creating a track of logs on which the large stones were rolled along. Another megalith transport theory involves the use of a type of sleigh running on a track greased with animal fat. 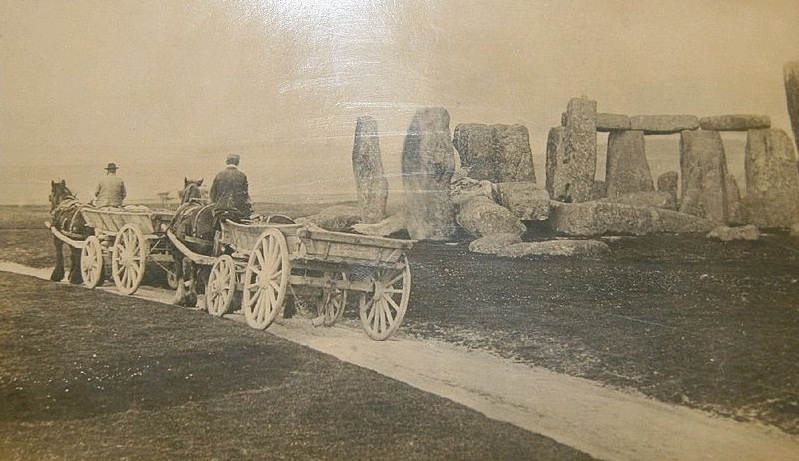 Such an experiment with a sleigh carrying a 40-ton slab of stone was successful near Stonehenge in 1995. A dedicated team of more than 100 workers managed to push and pull the slab along the 18-mile journey from Marlborough Downs.Proposed functions for the site include usage as an astronomical observatory or as a religious site. More recently two major new theories have been proposed. Professor Geoffrey Wainwright, president of the Society of Antiquaries of London, and Timothy Darvill, of Bournemouth University, have suggested that Stonehenge was a place of healing—the primeval equivalent of Lourdes. They argue that this accounts for the high number of burials in the area and for the evidence of trauma deformity in some of the graves. However, they do concede that the site was probably multifunctional and used for ancestor worship as well. Isotope analysis indicates that some of the buried individuals were from other regions. A teenage boy buried approximately 1550 BC was raised near the Mediterranean Sea; a metal worker from 2300 BC dubbed the “Amesbury Archer” grew up near the alpine foothills of Germany; and the “Boscombe Bowmen” probably arrived from Wales or Brittany, France. There are other hypotheses and theories. According to a team of British researchers led by Mike Parker Pearson of the University of Sheffield, Stonehenge may have been built as a symbol of “peace and unity”, indicated in part by the fact that at the time of its construction, Britain’s Neolithic people were experiencing a period of cultural unification. Another idea has to do with a quality of the stones themselves: Researchers from the Royal College of Art in London have discovered that some of the monument’s stones possess “unusual acoustic properties”—when they are struck they respond with a “loud clanging noise”. According to Paul Devereux, editor of the journal Time and Mind: The Journal of Archaeology, Consciousness and Culture, this idea could explain why certain bluestones were hauled nearly 200 miles—a major technical accomplishment at the time. In certain ancient cultures rocks that ring out, known as lithophones, were believed to contain mystic or healing powers, and Stonehenge has a history of association with rituals. The presence of these “ringing rocks” seems to support the hypothesis that Stonehenge was a “place for healing”, as has been pointed out by Bournemouth University archaeologist Timothy Darvill, who consulted with the researchers. Some of the stones of Stonehenge were brought from near a town in Wales called Maenclochog, a name which means “ringing rock”. The Heel Stone lies north east of the sarsen circle, beside the end portion of Stonehenge Avenue. It is a rough stone, 16 feet (4.9 m) above ground, leaning inwards towards the stone circle. It has been known by many names in the past, including “Friar’s Heel” and “Sun-stone”. Today it is uniformly referred to as the Heel Stone. [ At summer solstice an observer standing within the stone circle, looking north-east through the entrance, would see the Sun rise in the approximate direction of the heel stone, and the sun has often been photographed over it. A folk tale, relates the origin of the Friar’s Heel reference. The Devil bought the stones from a woman in Ireland, wrapped them up, and brought them to Salisbury plain. One of the stones fell into the Avon, the rest were carried to the plain. The Devil then cried out, “No-one will ever find out how these stones came here!” A friar replied, “That’s what you think!”, whereupon the Devil threw one of the stones at him and struck him on the heel. The stone stuck in the ground and is still there. Brewer’s Dictionary of Phrase and Fable attributes this tale to Geoffrey of Monmouth, but though book eight of Geoffrey’s Historia Regum Britanniae does describe how Stonehenge was built, the two stories are entirely different. Some claim “Friar’s Heel” is a corruption of “Freyja’s He-ol” from the Germanic goddess Freyja and the Welsh word for track. In the twelfth century, Geoffrey of Monmouth included a fanciful story in his Historia Regum Britanniae that attributed the monument’s construction to Merlin . Geoffrey’s story spread widely, appearing in more and less elaborate form in adaptations of his work such as Wace‘s Norman French Roman de Brut, Layamon‘s Middle English Brut, and the Welsh Brut y Brenhinedd. According to Geoffrey the rocks of Stonehenge were healing rocks, called the Giant’s dance, which Giants had brought from Africa to Ireland for their healing properties. The fifth-century king Aurelius Ambrosius wished to erect a memorial to 3,000 nobles slain in battle against the Saxons and buried at Salisbury, and at Merlin’s advice chose Stonehenge. The king sent Merlin, Uther Pendragon (Arthur’s father), and 15,000 knights, to remove it from Ireland, where it had been constructed on Mount Killaraus by the Giants. They slew 7,000 Irish but, as the knights tried to move the rocks with ropes and force, they failed. Then Merlin, using “gear” and skill, easily dismantled the stones and sent them over to Britain, where Stonehenge was dedicated. After it had been rebuilt near Amesbury, Geoffrey further narrates how first Ambrosius Aurelianus, then Uther Pendragon, and finally Constantine III, were buried inside the “Giants’ Ring of Stonehenge”. As well as the Historia Regum Britanniae, there is also place-name evidence to connect Ambrosius with nearby Amesbury. In another legend of Saxons and Britons, in 472 the invading king Hengist invited Brythonic warriors to a feast, but treacherously ordered his men to draw their weapons from concealment and fall upon the guests, killing 420 of them. Hengist erected the stone monument—Stonehenge—on the site to show his remorse for the deed. Stonehenge has changed ownership several times since King Henry VIII acquired Amesbury Abbey and its surrounding lands. In 1540 Henry gave the estate to the Earl of Hertford. It subsequently passed to Lord Carleton and then the Marquess of Queensberry. The Antrobus family of Cheshire bought the estate in 1824. During World War I an aerodrome (Royal Flying Corps “No. 1 School of Aerial Navigation and Bomb Dropping”) was built on the downs just to the west of the circle and, in the dry valley at Stonehenge Bottom, a main road junction was built, along with several cottages and a cafe. 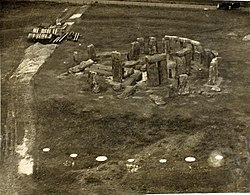 In the late 1920s a nationwide appeal was launched to save Stonehenge from the encroachment of the modern buildings that had begun to rise around it. By 1928 the land around the monument had been purchased with the appeal donations, and given to the National Trust to preserve. The buildings were removed (although the roads were not), and the land returned to agriculture. More recently the land has been part of a grassland reversion scheme, returning the surrounding fields to native chalk grassland. The first such Neo-druidic group to make use of the megalithic monument was the Ancient Order of Druids, who performed a mass initiation ceremony there in August 1905, in which they admitted 259 new members into their organisation. This assembly was largely ridiculed in the press, who mocked the fact that the Neo-druids were dressed up in costumes consisting of white robes and fake beards. Between 1972 and 1984, Stonehenge was the site of the Stonehenge Free Festival. After the Battle of the Beanfield in 1985, this use of the site was stopped for several years and ritual use of Stonehenge is now heavily restricted. Some Druids have arranged an assembling of monuments styled on Stonehenge in other parts of the world as a form of Druidist worship. The access situation and the proximity of the two roads has drawn widespread criticism, highlighted by a 2006 National Geographic survey. In the survey of conditions at 94 leading World Heritage Sites, 400 conservation and tourism experts ranked Stonehenge 75th in the list of destinations, declaring it to be “in moderate trouble”. As motorised traffic increased, the setting of the monument began to be affected by the proximity of the two roads on either side—the A344 to Shrewton on the north side, and the A303 to Winterbourne Stoke to the south. Plans to upgrade the A303 and close the A344 to restore the vista from the stones have been considered since the monument became a World Heritage Site. However, the controversy surrounding expensive re-routing of the roads has led to the scheme being cancelled on multiple occasions. On 6 December 2007, it was announced that extensive plans to build Stonehenge road tunnel under the landscape and create a permanent visitors’ centre had been cancelled. On 13 May 2009, the government gave approval for a £25 million scheme to create a smaller visitors’ centre and close the A344, although this was dependent on funding and local authority planning consent. On 20 January 2010 Wiltshire Council granted planning permission for a centre 2.4 km (1.5 miles) to the west and English Heritage confirmed that funds to build it would be available, supported by a £10m grant from the Heritage Lottery Fund. On 23 June 2013 the A344 was closed to begin the work of removing the section of road and replacing it with grass. The centre, designed by Denton Corker Marshall, opened to the public on 18 December 2013. The completed visitors centre at Stonehenge. Throughout recorded history Stonehenge and its surrounding monuments have attracted attention from antiquarians and archaeologists. John Aubrey was one of the first to examine the site with a scientific eye in 1666, and recorded in his plan of the monument the pits that now bear his name. William Stukeley continued Aubrey’s work in the early eighteenth century, but took an interest in the surrounding monuments as well, identifying (somewhat incorrectly) the Cursus and the Avenue. He also began the excavation of many of the barrows in the area, and it was his interpretation of the landscape that associated it with the Druids. Stukeley was so fascinated with Druids that he originally named Disc Barrows as Druids’ Barrows. 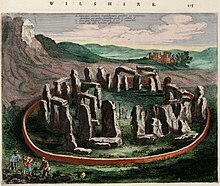 The most accurate early plan of Stonehenge was that made by Bath architect John Wood in 1740. His original annotated survey has recently been computer redrawn and published.Importantly Wood’s plan was made before the collapse of the southwest trilithon, which fell in 1797 and was restored in 1958. William Cunnington was the next to tackle the area in the early nineteenth century. He excavated some 24 barrows before digging in and around the stones and discovered charred wood, animal bones, pottery and urns. He also identified the hole in which the Slaughter Stone once stood. Richard Colt Hoare supported Cunnington’s work and excavated some 379 barrows on Salisbury Plain including on some 200 in the area around the Stones, some excavated in conjunction with William Coxe. To alert future diggers to their work they were careful to leave initialled metal tokens in each barrow they opened. Cunnington’s finds are displayed at the Wiltshire Museum. In 1877 Charles Darwin dabbled in archaeology at the stones, experimenting with the rate at which remains sink into the earth for his book The Formation of Vegetable Mould Through the Action of Worms. William Gowland oversaw the first major restoration of the monument in 1901 which involved the straightening and concrete setting of sarsen stone number 56 which was in danger of falling. In straightening the stone he moved it about half a metre from its original position. Gowland also took the opportunity to further excavate the monument in what was the most scientific dig to date, revealing more about the erection of the stones than the previous 100 years of work had done. During the 1920 restoration William Hawley, who had excavated nearby Old Sarum, excavated the base of six stones and the outer ditch. He also located a bottle of port in the Slaughter Stone socket left by Cunnington, helped to rediscover Aubrey’s pits inside the bank and located the concentric circular holes outside the Sarsen Circle called the Y and Z Holes. Richard Atkinson, Stuart Piggott and John F. S. Stone re-excavated much of Hawley’s work in the 1940s and 1950s, and discovered the carved axes and daggers on the Sarsen Stones. Atkinson’s work was instrumental in furthering the understanding of the three major phases of the monument’s construction. In 1958 the stones were restored again, when three of the standing sarsens were re-erected and set in concrete bases. The last restoration was carried out in 1963 after stone 23 of the Sarsen Circle fell over. It was again re-erected, and the opportunity was taken to concrete three more stones. Later archaeologists, including Christopher Chippindale of the Museum of Archaeology and Anthropology, University of Cambridge and Brian Edwards of the University of the West of England, campaigned to give the public more knowledge of the various restorations and in 2004 English Heritage included pictures of the work in progress in its book Stonehenge: A History in Photographs. In 1993 the way that Stonehenge was presented to the public was called ‘a national disgrace’ by the House of Commons Public Accounts Committee. Part of English Heritage’s response to this criticism was to commission research to collate and bring together all the archaeological work conducted at the monument up to this date. This two-year research project resulted in the publication in 1995 of the monograph Stonehenge in its landscape, which was the first publication presenting the complex stratigraphy and the finds recovered from the site. It presented a rephasing of the monument. More recent excavations include a series of digs held between 2003 and 2008 known as the Stonehenge Riverside Project, led by Mike Parker Pearson. This project mainly investigated other monuments in the landscape and their relationship to the stones — notably Durrington Walls, where another “Avenue” leading to the River Avon was discovered. The point where the Stonehenge Avenue meets the river was also excavated, and revealed a previously unknown circular area which probably housed four further stones, most likely as a marker for the starting point of the avenue. In April 2008 Tim Darvill of the University of Bournemouth and Geoff Wainwright of the Society of Antiquaries, began another dig inside the stone circle to retrieve dateable fragments of the original bluestone pillars. They were able to date the erection of some bluestones to 2300 BC, although this may not reflect the earliest erection of stones at Stonehenge. They also discovered organic material from 7000 BC, which, along with the Mesolithic postholes, adds support for the site having been in use at least 4,000 years before Stonehenge was started. In August and September 2008, as part of the Riverside Project, Julian Richards and Mike Pitts excavated Aubrey Hole 7, removing the cremated remains from several Aubrey Holes that had been excavated by Hawley in the 1920s, and re-interred in 1935. A licence for the removal of human remains at Stonehenge had been granted by the Ministry of Justice in May 2008, in accordance with the Statement on burial law and archaeology issued in May 2008. One of the conditions of the licence was that the remains should be reinterred within two years and that in the intervening period they should be kept safely, privately and decently. A new landscape investigation was conducted in April 2009. A shallow mound, rising to about 40 cm (16 inches) was identified between stones 54 (inner circle) and 10 (outer circle), clearly separated from the natural slope. It has not been dated but speculation that it represents careless backfilling following earlier excavations seems disproved by its representation in eighteenth- and nineteenth-century illustrations. Indeed, there is some evidence that, as an uncommon geological feature, it could have been deliberately incorporated into the monument at the outset. A circular, shallow bank, little more than 10 cm (4 inches) high, was found between the Y and Z hole circles, with a further bank lying inside the “Z” circle. These are interpreted as the spread of spoil from the original Y and Z holes, or more speculatively as hedge banks from vegetation deliberately planted to screen the activities within. In July 2010, the Stonehenge Hidden Landscape Project discovered a “henge-like” monument less than 1 km (0.62 miles) away from the main site. This new hengiform monument was subsequently revealed to be located “at the site of Amesbury 50”, a round barrow in the Cursus Barrows group. 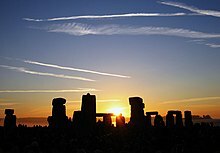 On 26 November 2011, archaeologists from University of Birmingham announced the discovery of evidence of two huge pits positioned within the Stonehenge Cursus pathway, aligned in celestial position towards midsummer sunrise and sunset when viewed from the Heel Stone. The new discovery is part of the Stonehenge Hidden Landscape Project which began in the summer of 2010. The project uses non-invasive geophysical imaging technique to reveal and visually recreate the landscape. According to team leader Vince Gaffney, this discovery may provide a direct link between the rituals and astronomical events to activities within the Cursus at Stonehenge. On 10 September 2014 the University of Birmingham announced findings including evidence of adjacent stone and wooden structures and burial mounds, overlooked previously, that may date as far back as 4000 BC. An area extending to 12 square kilometres (1,200 ha) was studied to a depth of three metres with ground-penetrating radar equipment. As many as seventeen new monuments, revealed nearby, may be Late Neolithic monuments that resemble Stonehenge. The interpretation suggests a complex of numerous related monuments. Also included in the discovery is that the cursus track is terminated by two five-meter wide extremely deep pits, whose purpose is still a mystery.